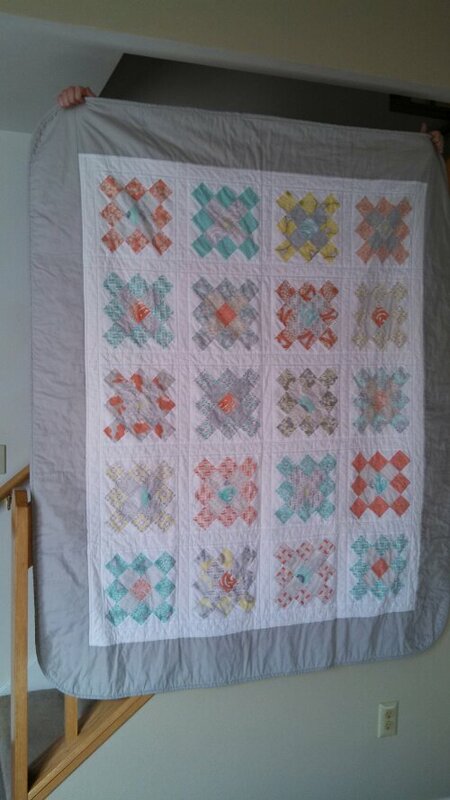 It’s been a whirlwind of weddings and babies the last 6 months, and it has definitely kept my quilting in check. 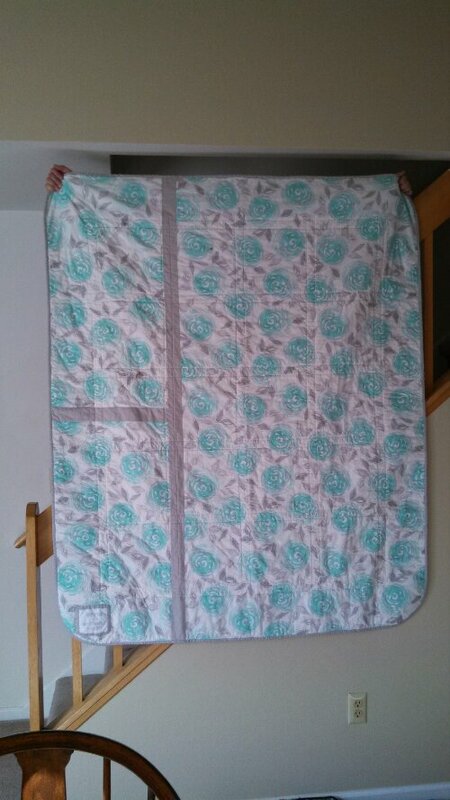 As of February 1st I was still behind a baby quilt for a baby that was born at the end of December. I’m putting the finishing touches on that one and will share soon. 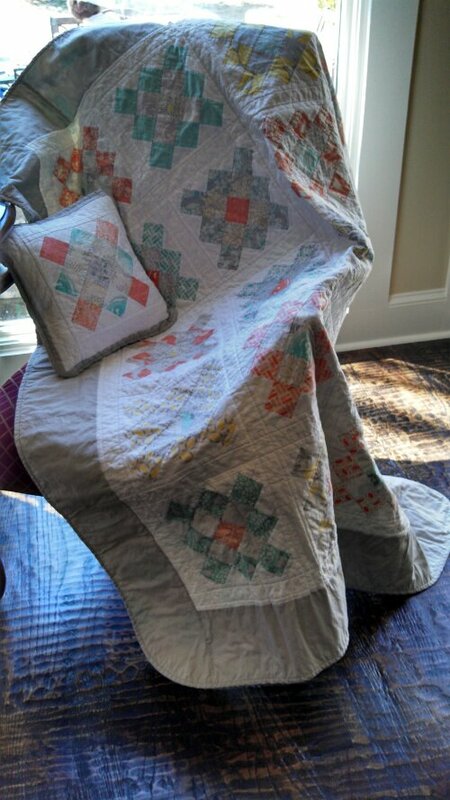 But today I want to share the latest adult quilt I completed in less than two weeks. This is what 500 2 1/2 inch pieces looks like just two weeks before you have to have a quilt done. 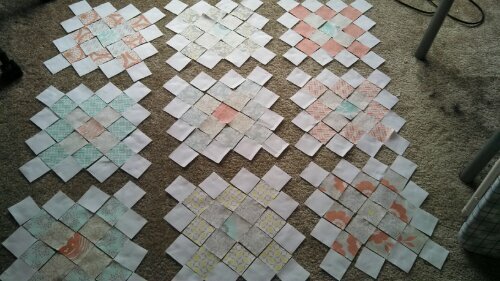 I sewed them all into their squares one weekend. Thanks to catching a stomach bug, the top wasn’t completed until the following weekend. Along with basting, quilting a double line along the sashing and figuring out bias binding for rounded corners. I also threw in a pillow because that’s how I pictured it. And my visions sometimes get the best of me regardless of how impractical they are. I finished hand sewing the binding before going to Bingo the night before we left to head south and celebrate with the bride and groom. I was so excited to have it finished to take along with me. I found a fabric line that had those colors and fit the vintage, but not too vintage feel. I stuck with Modern Roses for all but the border because they played so well together. I always try to make sure the quilt is perfect for my friends, but there’s always just a bit of doubt as I drop it on the gift table. This time my concerns were set aside when I saw the bride’s teal shoes (with her amazing vintage dress). Then the reception had lots of flowers and a vintage modern feel, and I breathed another sigh of relief. Sometimes I just need confidence in knowing I know my people! The back was the only thing I wasn’t quite sure of. I went with large scale flowers, which felt a little wrong to give as a joint gift to a husband and wife. Now, having met the husband, I think it’s very safe to assume he’ll be just fine with it. It was so great to put a face to a name that I’ve heard from my friend so many times in such a reverent and delighted way. And I am so so happy to see my friend so happy. Putting these 500 perfect little pieces together was just the icing on the (beautiful) wedding cake.